Yeah for Thursday! After a long weekend and loads of relaxation I have a lot to be happy about. My new phone. I finally got a smart phone which means that I can see all the fabulous emojis that my friends have been sending to me. It’s also good for other useful things. New ear piercings. 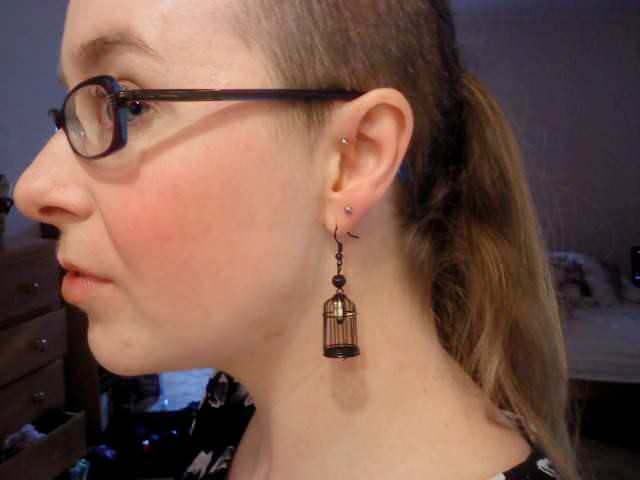 I have wanted to get another ear piercing for ages and last Sunday I took the plunge. I couldn’t make up my mind whether I wanted another hole in each lobe or my forward helix pierced, and the gentleman at the piercing studio said he could do all three if I wanted. So I did. Lemme tell you, three piercings at once is no mean feat, but I’m really glad I did it. Horror and fantasy films. Now that October is here I have thrown myself into watching all my favourite Halloween films with gusto. Lurve-ly vintage lingerie. 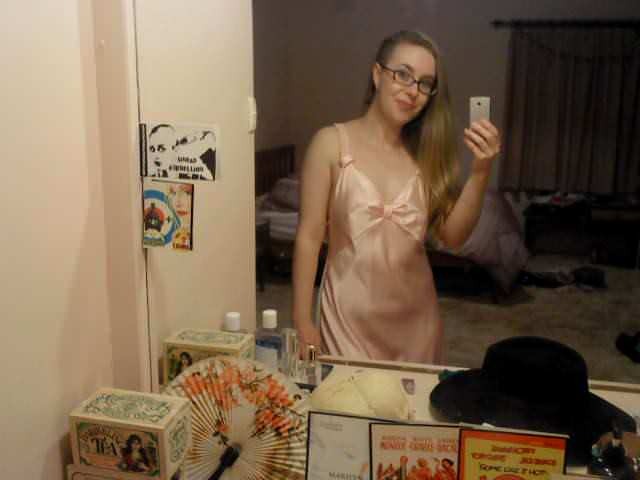 I went thrift shopping with Ms Fairchild a few weeks ago and the two of us got stacks of gorgeous vintage underthings. It’s always fun shopping with a friend who is a different size to you, because you never fight over items. We were both throwing things back and forth when we found something that we thought might fit the other one and both walked away with a massive haul. My new Instagram account. Follow me! Letting Jelly enjoy a bit of outside time each day. 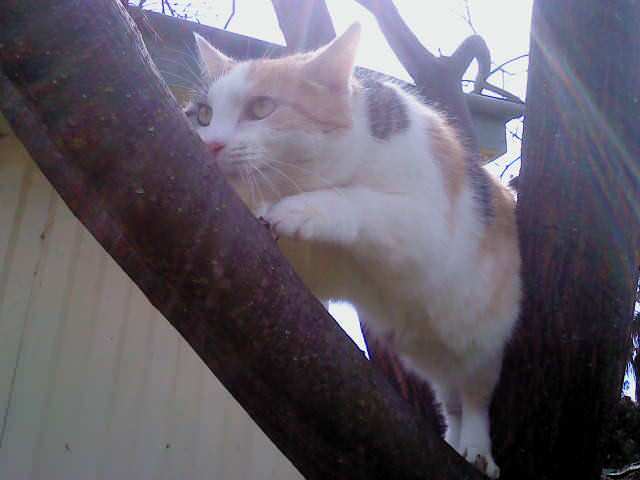 She has gotten so good at tree-climbing. 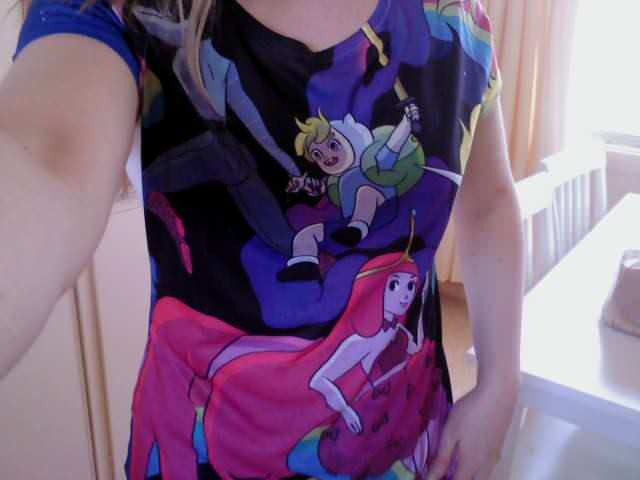 My new Adventure Time tee shirt. Red velvet cupcakes and Earl Grey tea. 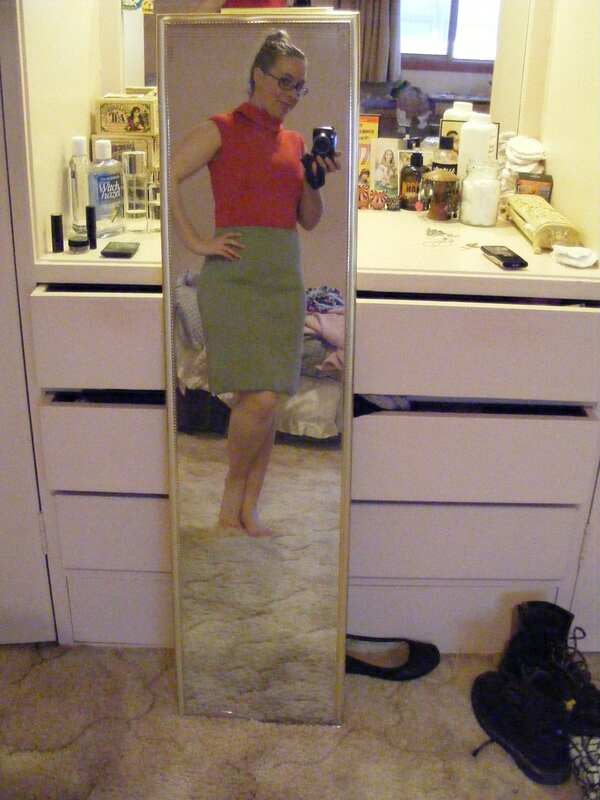 This vintage wool dress I got from Raised by Gonks Vintage. 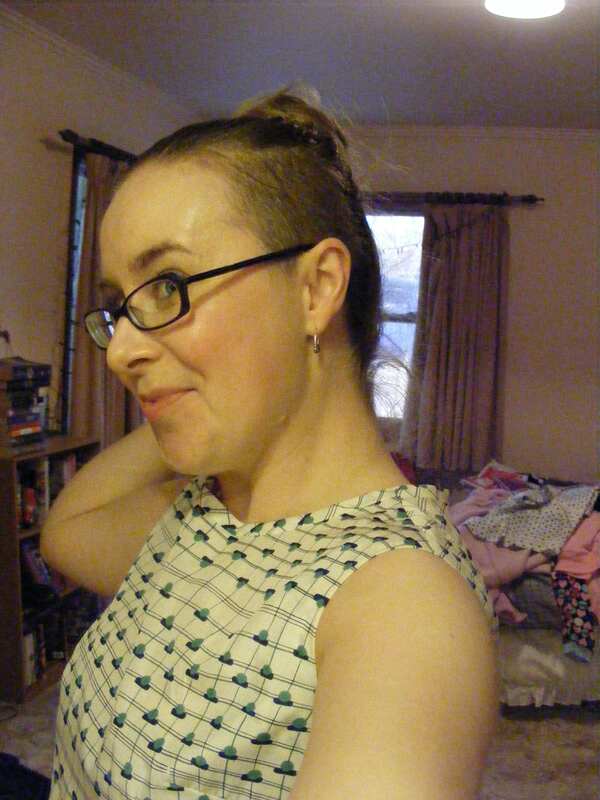 And ditto this cute 60’s sundress. Warm weather and bare feet in the grass. What do you love this week? Feel free to include your own Things I Love Thursday list in the comments. Previous A geek’s guide to online dating: your profile picture.  Next 5 Fandom Friday: My favourite fictional teachers. Aren’t you so cute with your new helix and double ear piercings. Don’t know if you realize from your profile that you have the perfect nose for a little piercing there too. Promise you’d look good with either a little diamond nose stud or a thin, pretty little silver nose ring. Either would give your face a gracefully elegant look of sophistication. You have such a cute nose for a little piercing. Sure that I’m not the first to comment on how lovely you’d look with the nose ring you’ve “always wanted.” Promise the little sparkle from a teeny, tiny diamond nose stud would be seen only from afar and hide any view of scarring. Sooo many awesome things to love, wear and enjoy! Your new piercings are beautiful! How fun that you and Ms. Fairchild got to hang out and go thrifting together. That’s awesome! I’ve only ever had the chance to shop with a fellow vintage gal once before (my good friend Laurie, aka Retro Reporter, from Edmonton) and it was an almost surreal-y cool experience for me. Congrats to you both on scoring oodles of beautiful new (old :)) underpinning. Thank you sweetheart. If only you could have joined us! I have a feeling the three of us would get along famously. Afterwards I cooked us up a gluten-free feast which we ate while wearing our new vintage slips. It was a blast. Things I like today…valium LOL. I am very excited for my trip and I have very little left to do…but things are making me panic and valium is very helpful. Also a great physio who is trying to fix my neck before I go. I love shopping with you. So much fun and so great shopping with a different size friend. Ahaha! Sometimes it’s the littlest things that make the biggest difference, eh? I had a ball shopping with you too. We need to do it more often. Thank you! it’s the first time in years that I’ve had a proper dressing table and I enjoy covering it with lots of awesome bits and bobs to inspire me while I get ready each day.